The Bruneau River is considered one of the most beautiful desert river canyons. Trips can be combined with the more challenging Jarbridge River for a longer wilderness experience. 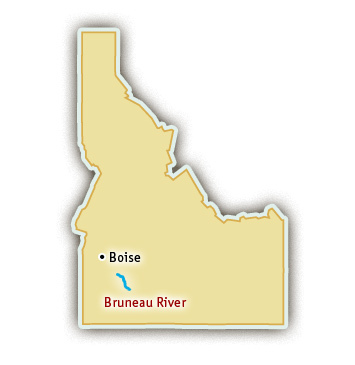 Rafting trips on the Bruneau River are 3-5 days, depending if they begin on the Jarbridge River or the Bruneau itself. River trips last four days with beginner to intermediate Class III-IV rapids. While the rapids of the Bruneau are challenging, the weather can be even more exciting, bringing both sun and snow in the same day during its May through mid-June season. Bruneau River rafting is the West’s best-kept secret with a canyon unique to this continent. Some refer to it as the “Sistine Chapel” of all river canyons. The turquoise waters of the Bruneau River run for 40 miles through a tall canyon of red rock reminiscent of Bryce and Zion National Parks. The steep and narrow character of the Bruneau River canyon provides a lot of shade for the riverside below, creating a lush riparian environment uncharacteristic of a desert river. In fact, the canyon is a safe haven for three endangered plant species. In May, wildflowers bloom and songbirds abound– more than 60 bird species call the Bruneau River home. Side hike opportunities are also numerous with one leading to Cave Creek where Native Americans once settled. The Bruneau River and the Jarbridge River are free-flowing, so the rafting season is dictated by the snow-melt and precipitation. Trips are run in the spring from May through the middle of June.